The Otto Luyken Cherry Laurel is a dwarf form of the regular cherry laurel, idea for smaller gardens, or where you want a smaller specimen or hedge. It will grow 3 to 4 feet tall and may eventually reach 10 feet if unclipped, and will spread 6 to 8 feet wide. 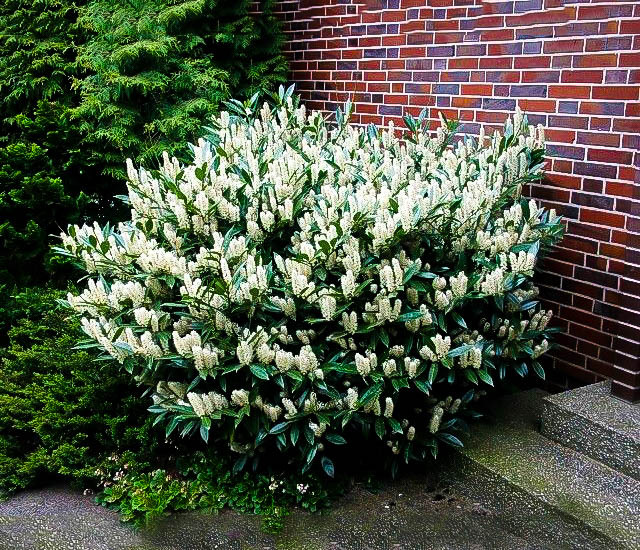 It has much smaller leaves than the common cherry laurel, just 1 inch wide and up to 4 inches long, so the plant has a much more delicate appearance and fits much better into smaller gardens. If left unclipped it will produce attractive upright spikes of fragrant flowers 4 inches tall in spring. It makes an ideal plant for a low, easy-care hedge, or as part of the foundation planting around your house, especially for the shady corners. Plant your Otto Luyken Cherry Laurel in a sunny or shady spot, in any kind of soil. It will grow most rapidly in richer, moist soil, but established plants are very drought resistant. It has no pests or diseases and is not even eaten by deer. It can be clipped into a hedge that will quickly separate one part of your garden from another with a neat, glossy plant that always looks great, no matter what season it is. For low-maintenance gardens this is an ideal choice. Choosing plants for your garden can be difficult, but the Otto Luyken Cherry Laurel is an obvious choice for anyone wanting neat, manageable plants that are no trouble to grow, and need no special care at all. 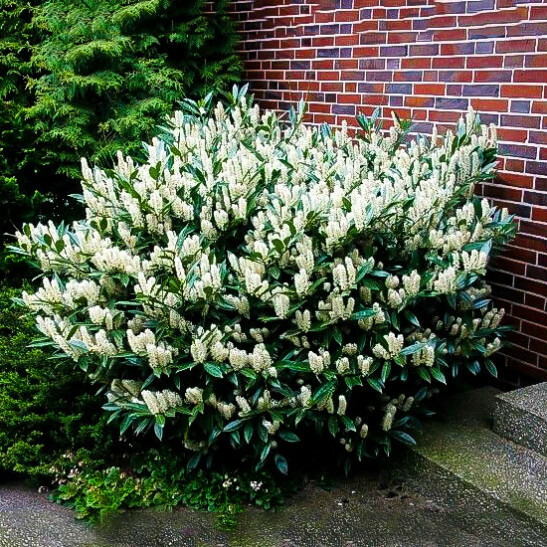 This evergreen shrub is a dwarf version of the common cherry laurel, with much smaller, narrower leaves and growing only 3 to 4 feet tall, but 6 to 8 feet wide. The Otto Luyken Cherry Laurel will grow in sun or partial shade, in almost any kind of soil and it looks attractive all year round with no input from you. Not only that, it has attractive spikes of fragrant white flowers in spring, adding to the floral abundance of that season. 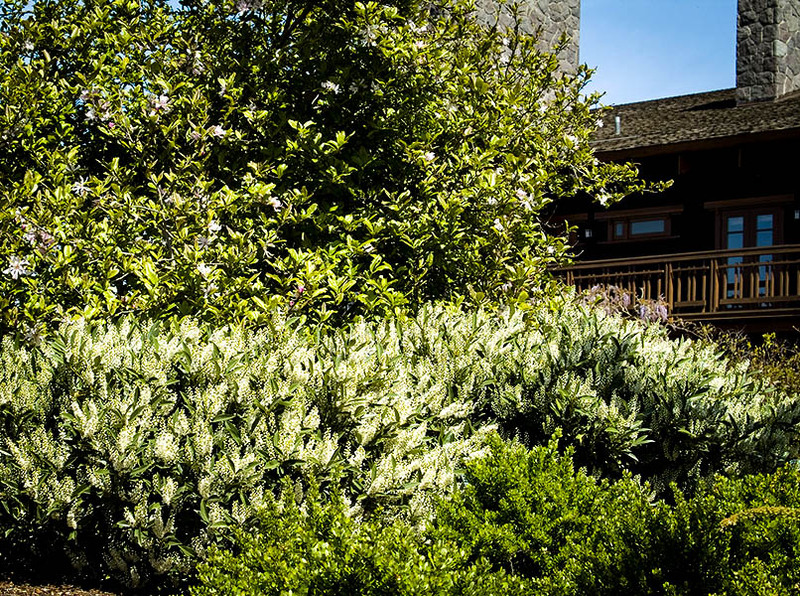 It is an ideal choice for planting around your home, along with other foundation plants, to create all-year structure and form to show off your home to its best. 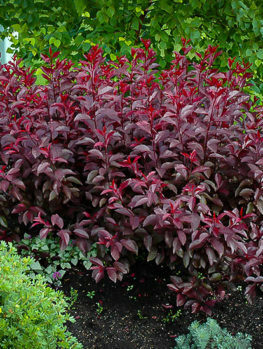 It also mixes well with other shrubs in a garden bed of any size. Planted in groups it is an ideal background plant for filling those shady corners of the garden, leaving the sunny areas for more colorful flowering plants. The Otto Luyken Cherry Laurel is a fast-growing shrub that will quickly from an attractive broad, dense plant that is always glossy green and healthy in every season. 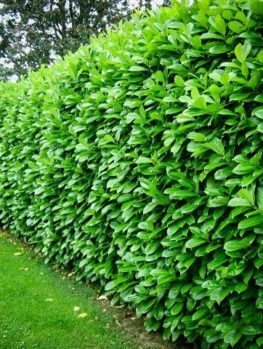 Because it does not grow too tall, it is ideal for a low hedge along a driveway for example, or as a low barrier, clipped or unclipped, between one part of the garden and another. This way you can bring structure and form to your garden, without blocking attractive views, interfering with other plants, or throwing too much shade onto your beds. As a plant that is useful all over the garden, there is hardly a property, big or small, that cannot use this plant effectively. The Otto Luyken Cherry Laurel is hardy in zones 6 to 9, so it will grow throughout the south, west and most of the east of America. It does especially well in warmer areas, where it should be planted in shade, rather than in full sun. This plant is very tough and will grow in almost any soil, tolerating poor soils, clay and urban air-pollution without any trouble at all. It is also tolerant of salt-spray, so in coastal areas it will grow well even in view of the sea. Those places often have dry, sandy soil too, and that will not be a problem once your plants are well established. 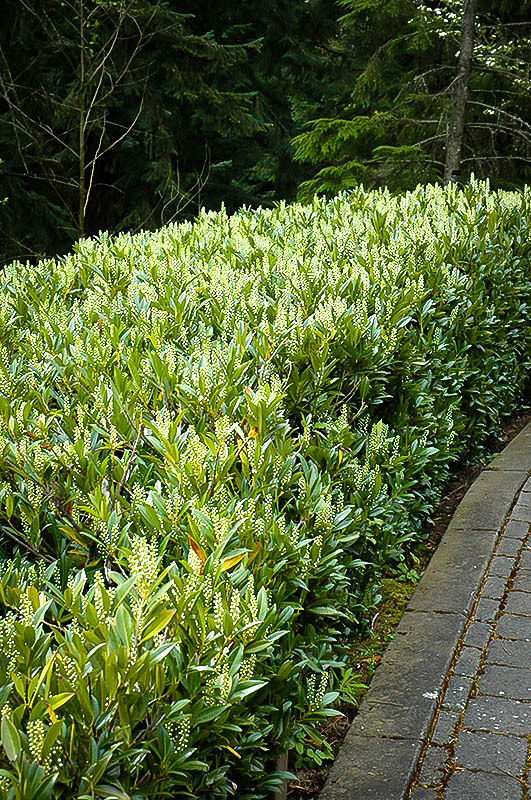 Unlike many other hedge-plants, the Otto Luyken Cherry Laurel will grow strongly in both sun and partial shade. This means that even if part of your hedge is shaded, it will be just as lush and strong as the other parts growing in the sun. The value of this plant for those dark corners of the garden cannot be overstated. This really is a truly shade-tolerant plant. Many plants that grow well in shady places have dark, dull foliage, so they disappear in the shadows and have very little visual impact. Not this plant. The glossy foliage is light-green, so these two features make it really stand out, even in dim light, lifting and brightening exactly those spots in your garden that need it most. Deer are often a problem in gardens, especially in rural areas, but also in cities and suburbs. These animals may be cute, but they can devastate your garden when looking for food in the winter. The Otto Luyken Cherry Laurel will not have this problem, since deer sense the toxic nature of the plant, and avoid it. The most that might happen is a nibble to check it out, but after that they will leave. No need for repellent sprays, or expensive fencing. Garden soils come in all kinds; from loose, sandy soil to heavy, dense clay – and everything in between. Some soils are acidic and other alkaline. It really doesn’t matter to the Otto Luyken Cherry Laurel – it is happy to grow in just about any kind of soil. The only thing it does not like is soil that is constantly flooded or saturated with water. Some shady corners can also be wet, so if that describes the spot you are thinking off, build a low mound, 6 to 8 inches tall, and 3 feet across, where you want to plant. Remove the soil for the mound from around the spot, making a low ditch. This will raise the area and make it drain, so that your plant will be happy, and probably never need watering either. You should keep all new plants well-watered, so that they establish well, and are able to grow vigorously. We want their roots to spread wide and deep, so that when drought comes, they will survive. If you do this for the first year, or perhaps two, after that these tough plants will take drought and heat with no problem, thriving under difficult conditions and always looking fresh and green. That glossy leaf-coating is a natural waterproofing, that keeps the moisture inside the leaves, so the plant can survive extended dry periods. The good news here is that this plant rarely suffers from any of the pests that can plague other garden plants. It is tough, and pests and diseases stay away. You will not have to be spraying, or seeing your plant damaged by pests, or dying of diseases. It will grow well with no significant care from you, after that initial period of watering. The Otto Luyken Cherry Laurel grows rapidly into a rounded shrub 3 to 4 feet tall and 5 to 6 feet across. Ultimately it may grow 6 to 10 feet tall and perhaps 8 feet across if you leave it for years completely unclipped. 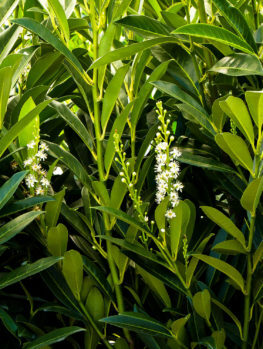 The glossy, evergreen leaves are just 1 inch wide, and up to 4 inches long, much smaller and more attractive than the leaves of the common cherry laurel. In spring your plant will produce upright clusters of fluffy white flowers. These are sweetly fragrant, and this variety is renowned for its heavy flowering, unlike some other Cherry Laurel trees, which flowers poorly. So dense and attractive are the flowers, that this plant is definitely worth growing as a flowering shrub, and adding to your garden for that purpose alone. The only thing that will stop a big display of flowers is clipping several times a year. If you want to control the size, but keep the flowers, clip immediately after flowering, and then not again that year. The black ‘cherry’ fruits which are sometimes produced after the flowers are popular with birds, but they should not be eaten by humans, as they are poisonous. As they are not particularly striking, clipping after flowering will remove them without seriously damaging the decorative qualities of this plant. The leaves are also toxic, so do not use this plant for a hedge if horses and other grazing animals can reach it. The Otto Luyken Cherry Laurel is not just an ordinary plant. It has been specially selected for its dwarf habit and prolific flowering. Like many such plant varieties, it cannot be grown from seed, as seedlings will not resemble it at all, and their habits will be completely unpredictable. Instead, because of its special qualities, it must be grown from stem pieces, not seeds. This takes longer, and more skill is involved, so if you see cheaper plants, they will almost certainly be seedling plants. These, and any other plants not carrying this exact name, could easily grow into enormous shrubs with large leaves, reaching perhaps 20 feet tall and the same across. They will be totally unsuitable for a small garden. It always pays to make sure you are getting the right plant. Low hedges serve lots of useful purposes around the garden, and are often not considered. After you have surrounded your garden with a tall privacy screen, you need to separate it into areas for different purposes. Perhaps you have a vegetable garden, or a play area for your children. Perhaps you want to have a terrace separated from the rest of the garden. Plants that will naturally grow dense, but not too tall, and that can be clipped into more formal shape is wanted, are important in raising the look of your garden to the next level. That is where this great laurel tree comes in. Much smaller than other forms, it will grow to just 3 or 4 feet tall, but dense and bushy. That is the perfect height to give a sense of enclosure and privacy, without creating a ‘wall’ you can’t see over. If you want an informal screen, needing little or no clipping, plant a row of Otto Luyken Cherry Laurel, spacing the plants 3 to 5 feet apart. At the closer spacing it will just be a few years before you have a dense screen. The wider spacing will take a year or two longer, but it too will soon fill-in. It all depends on how much of a hurry you are in. A light trimming once a year, after the flowers fade, will keep your plants very compact and dense, while still leaving a more informal look to them, and allowing plenty of flowers to form. Whatever spacing you use, keep the distance between the plants equal, for the best look possible. If a dense, neatly-trimmed hedge is what you see looking best in your garden, then this is the perfect plant. It can be clipped and trimmed into a perfect flat surface, and the more you trim the smaller and neater the leaves will become. You can have a straight hedge, or a curved one, the choice is yours. Space the plants 3 feet apart, keeping the spacing even. The easiest way to get it right is to dig a trench along the line where you want the hedge. Don’t forget to allow room for the width, so don’t plant right up against a fence, or too close to a walkway. Once you place the plants in the trench you can adjust the spacing, and get them perfectly in line, much more easily than with separate holes. Begin clipping as soon as the plants grow, just a little, regularly. This will develop a strong, dense structure to your hedge. To get the maximum rapid growth from your plants, apply water and fertilizer during the first few years, but after that this plant is extremely resistant to drought and poor soil conditions and will thrive on neglect. It has no significant pests or diseases and it is very deer resistant, so nothing is going to stop your Otto Luyken Cherry Laurel from looking healthy without needing to use sprays or dangerous chemicals. New plants should be watered once a week, or twice a week in very hot or dry weather. This plant will grow at its quickest if it has a good supply of water and nutrition when it is young and developing. Once it is established, it is very drought resistant, so you will not need to water except during periods of extended drought. Even if they become completely dry and begin to wilt, established plants will survive and bounce right back once they receive some water. Putting mulch around new plants is an excellent way to conserve moisture and prevent weed competition. Cover the root area with a layer 2 or 3 inches deep – no more. Be careful to keep the mulch away from the stem and foliage – leave a couple of inches around the stem free of mulch. Young plants should be fertilized with any kind of fertilizer recommended for evergreens or hedges. Follow the directions, but usually plants are fed in early spring, and again in late summer. Feeding your plants will really make a big difference to the rate of growth, flowering and the overall health of your plants. 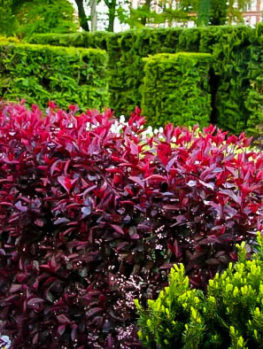 Once your plants are established, and your hedge is fully-grown, you may not need to feed anymore, as long as the foliage is a healthy green and good growth is seen each spring. The Otto luyken Cherry Laurel is very easy to trim. Young plants are best trimmed with hand pruners, rather than hedge trimmers, so that the leaves are not cut. Once your hedge begins to develop, then you can use a regular trimmer, as the leaves will now be smaller. The best times for trimming are immediately after flowering, and if you want a more formal look, it can be trimmed from late winter, throughout spring and summer, and into the early fall. 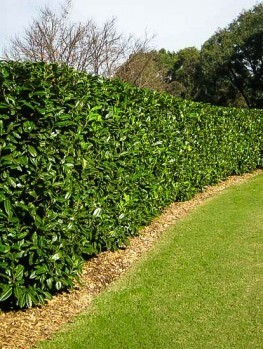 The more you trim, the thicker and denser your hedge will become. Remember to trim the sides so that they slope inwards just a little. This will keep the lowest branches vigorous and your hedge green right to the ground. If you find your plants have become too large, and you want to cut them back a lot, don’t worry, even thick, bare branches will quickly re-sprout and fill right in again. The Cherry Laurel (Prunus laurocerasus) is also called English Laurel and has been grown in gardens for hundreds of years. It is found growing naturally around the Black Sea, in Turkey and in Iran. The early settlers brought plants for their gardens from Europe, but the Otto Luyken variety was only found in 1968 at the Hesse Nursery in Weener, Hanover. It quickly became popular across Europe and was soon brought to America, where it has proved just as popular. It received an Award of Garden Merit from the prestigious Royal Horticultural Society of England in 1993 for its compact size and abundance of flowers. Because this is a special dwarf form of the common cherry laurel, it is important to obtain plants from reliable growers, and we have direct contact with top growers across the country. Despite receiving new shipments constantly, our stocks can run out, so to avoid disappointment, and miss out on growing one of the best evergreen shrubs available, order your Otto Luyken Cherry Laurel plants now and enjoy relaxed, low-maintenance gardening with this easy-care and versatile plant.